How Long Will I Be Off Work For Implant Surgery? How long can I expect to be off work following implant surgery? A common question we get asked by our patients trying to decide the best timeframe to plan their implant surgery is how long they can expect to be off work after an implant surgery. It’s a great question, and most patients are surprised to hear that in some cases, they can expect to go back to work the very next day! The recovery time varies depending on what type of implant surgery is being done and how extensive it is. 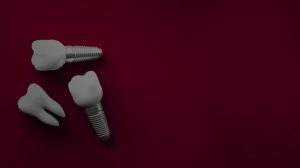 For individual dental implants or bone grafting surgery, the surgery is minimally invasive and patients can return to work the next day with little to no discomfort. For bigger procedures, such as complete teeth replacement or other implant procedures where we replace all teeth with implants and fixed bridges, we generally recommend that a patient takes about a week off of work. There can be bruising and swelling after the surgery, as well as some minor recovery expected after being under general anaesthesia if required. The good news is that we prescribe medications before the surgery that help alleviate any pain, swelling and discomfort during the healing time, making the recovery time as easy as possible on our patients. Dr Helen Voronina is the principal dentist at "Dr Helen's Dental & Implant Studio". Having graduated from the University of Melbourne and later from the Brener Implant Institute, in her practice she places emphases on the implant, aesthetic and reconstructive dentistry. She is a member of the Australian Dental Association, The International Congress of Implantology and The Australian Society of Implant Dentistry (ASID). She is a former chairperson for the National Dental Foundation and an official dentist for the Melbourne Hearts Football Club.